Films without borders, crossing Arizona. During the film season we screened Crossing Arizona, as the second night of the films without borders season. The discussion which followed the film brought up many issues and points which people might like to explore further. –The journey people take before they reach the US (with many border points before the US and Mexico border). Here is a report by Amnesty International on abuse of migrants travelling through Mexico. There is also a book called Enriques Journey which follows the journey of someone travelling from Honduras to the US , which talks about communities providing food to help people ridinf the trains north. Here is a link to the NoMoreDeaths group who are constantly working here and updating their site with news and reports. –Wider issues/struggles glimpsed in the film. Here is a link to the filmaker’s site which has more info than the film could cover including recommended reading, news stories, cross-border alliances. –Parallel situations throughout Europe : “According to the following press review at least 14,921 people have died since 1988 along the european borders.” Fortress Europe‘s website. A site dedicated to the situation in Greece. This site is frequently updated too. Someone mentioned this is a good film to watch about the Spanish border with Africa called 14 kilometers. And more close to the UK, is Calais. The Free Movement For All fundraiser & infonight on Friday 10th September at the Star and Shadow Cinema was an ace night, there was a friendly atmosphere, the bands were all on great form and delectable food and cakes were provided. The night was partly in aid of the No Border Camp in Brussels, and funds were also being raised for The English Language Conversation Group, an informal group held at the Star & Shadow Cinema, Newcastle, where volunteers to help people learn and practice their language skills are always welcome. The night began with a screening of ‘Outside of EUrope’, a documentary by Wide Open Exposure. The film documents the harsh realities of the European border regime, and the impact of the exclusionary policies of the EU. This was a great introduction to the issues which will be the focus of the upcoming Brussels No Border Camp, 25 September – 3 October. Preparations are now well underway for the Camp, with the latest programme and location information online here. After the film, Milky Wimpshake played a brilliant set, with some good onstage banter from Pete Dale, tight garage punk-pop songs and amusingly undiluted lyrics. ONSIND (One Night Stand in North Dakota), singing, guitar playing, spot-on lyric-writing, great guys from Durham had the audience demanding more of their lo-fi, anti-folk punk-pop gems. Their anti-capitalist, anti-consumerist, queer, anti-sexist etc melodic songs performed with humour and enthusiasm were shout-a–long political feelgood nuggets. 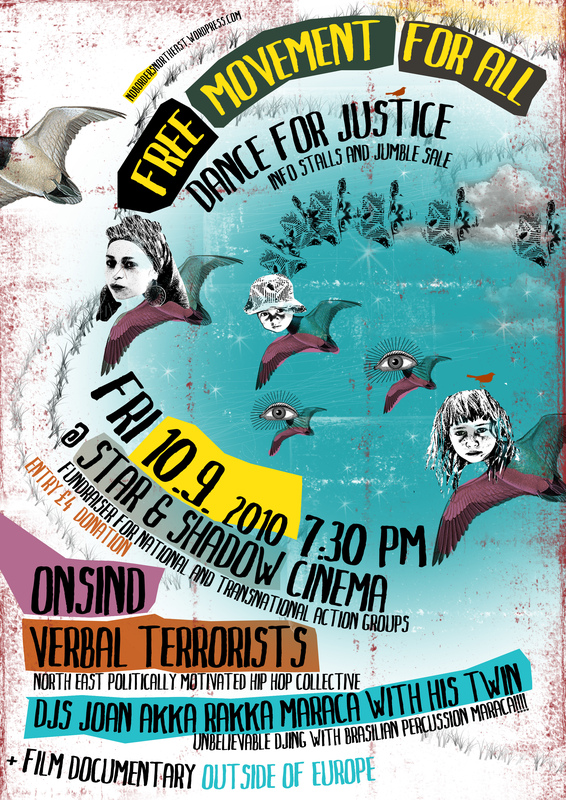 The Verbal Terrorists and DJ Jupiter provided top quality hip hop bursting with onstage energy, slick beats, amazing rhymes and songs ranging from criticising the financial system (in the most lyrically catchy way imaginable!) to praising people for taking a stand. After a few more well known ones like ‘The Dance of the Money Men’ and ‘Risin Up’ they treated the audience to a new tune they’ve been working on which was every bit as satisfying as you would expect from them and the dancing didn’t stop. Thanks to the quality line-up and committed acts the night managed to mix serious issues and proper fun. 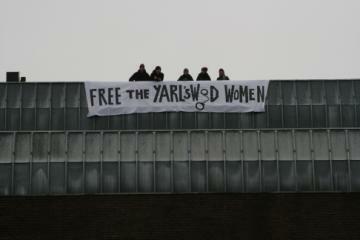 With thanks to all who supported the night. Burn the Border! Freedom for the Vincennes 10! The largest detention centre in France burnt on June 22nd 2008. 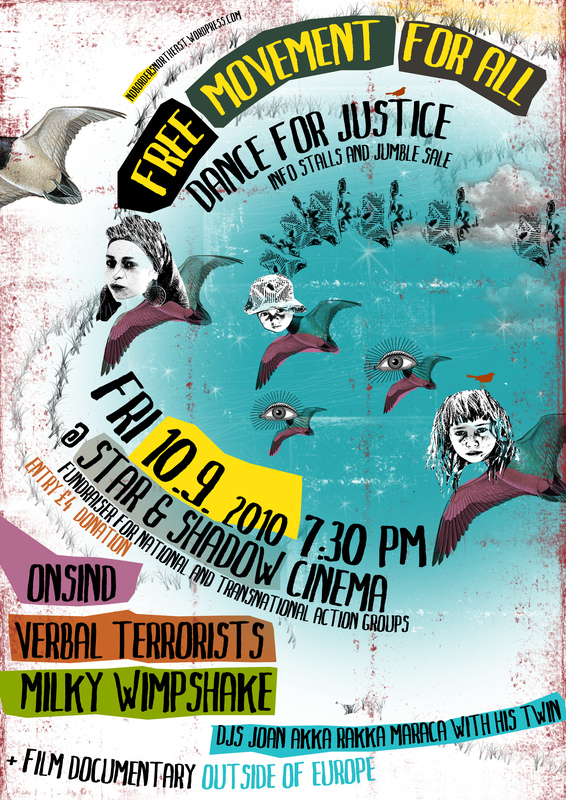 From June 2008 to June 2009, some ten former detainees have been arrested and imprisoned – most of them for nearly one year – in preventive jail. They are charged with “damage”, “voluntary destruction of the buildings of the Vincennes administrative detention centre”, and/or “aggression in band against a police officer, without causing an incapacity of work for more than eight days”. To prevent this type of revolt from spreading, the State must strike hard, it has to find culprits. Ten persons were arrested to serve as examples. We do not care whether they are “culprit” or “innocent”. By the punishment of these persons, the State wishes to make disappear revolts, denials of submission, and acts of resistance from the part of those who are, or will be in the future, between the walls of these centres. The Vincennes revolt is not isolated. Wherever are detention centres, revolts will spring up, fires will start, flights, hunger strikes, mutinies, and destructions will take place. It has been so in France (centres were burnt in Nantes, Bordeaux, and Toulouse), and in many European countries (Italy, Belgium, the Netherlands, Great Britain) or in countries to which border control is outsourced such as Turkey and Libya. The fire at the Vincennes detention centre is not only a symbol: as an immediate consequence of the disappearance of its capacity for 280 people, rounding up and deportations greatly decreased in the Paris region during the following period. Concretely, arrests were avoided by the thousands. This act of the detainees has put out of order for a while the deportation machine. 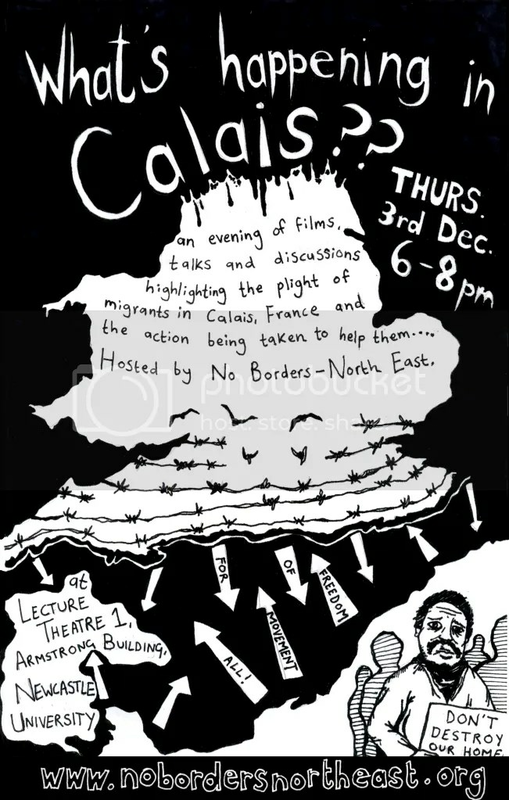 On the 3rd of December, from 6-8pm, we will be hosting an info night based on the situation for migrants in Calais. It will take place in Lecture Theatre 1 of the Armstrong Building, which is one of the main buildings on the Newcastle University campus. 1. There is now a ‘Calais Migrant Solidarity’ Unity Trust bank account, sort code: 086001 account number: 20233983. Something you can do to help the migrants in Calais, that does not take any effort or money, is to order your 4 free 02 sim cards. Get them sent to your house, then message me to tell me you have some, and then i will send you the adress to forward them on to into either UK or Calais, depending on where you live. and music from Newcastle band No Fit State! 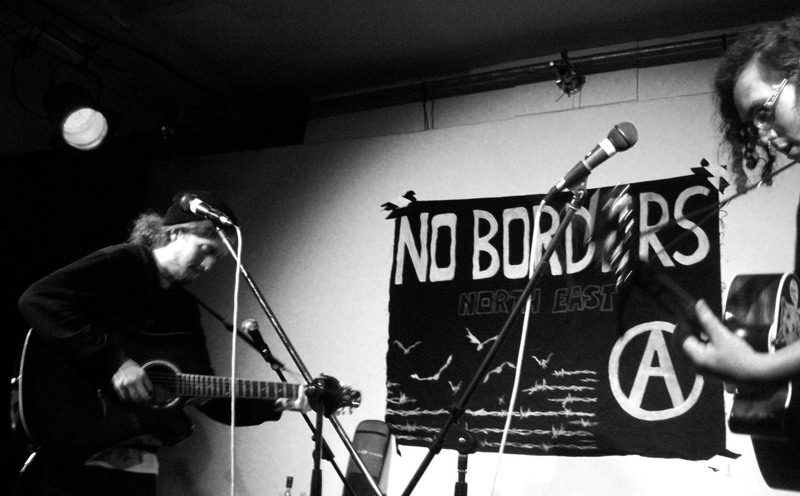 People from No Borders North East will be supporting this opportunity for people to get together to share info and ideas on the border regime and the growing movement for freedom of movement for all! 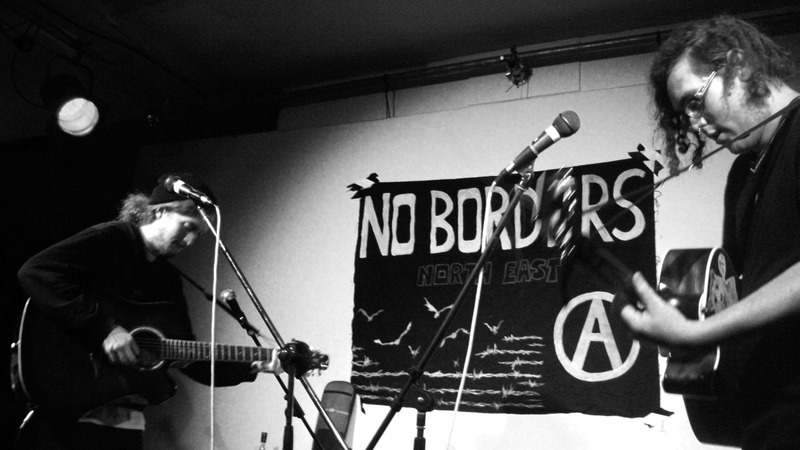 Workshops, updates and films on current struggles against borders, and discussion on setting up a Scottish No Borders network. Plus No Borders UK Info Tour 2009 – an exhibition of striking photographs from Calais by French photographer Julie Rebouillat, along with info on the European border regime and the forthcoming Calais No Border Camp, 23-29 June 09.
freedom of movement for all, not just the privileged few. of migrants and local activists alike. into citizens and non-citizens, into the documented and the undocumented. But why a protest camp in Calais? where they are forced to sleep rough in their hundreds. Furthermore the UK Border serves as a mechanism of internal control and filtering in Europe. By pushing the UK border onto French territory, the British government has made it impossible for many people to claim asylum in the UK and forced those that do try into the hands of people smugglers. This situation can only be changed when we start a public discourse about the UK Border regime and the humanitarian situation of the people who try to reach the UK from France. The Border regime can be only understood in its political and economic context, i.e. the exploitation of cheap work from migrants. Therefore we think that the struggle for equal rights for migrant workers and the struggle against the European detention and asylum system are closely connected. We also believe that we need to intensify the transnational cooperation between initiatives made by people on both sides of the border who find the current situation unbearable. no one is illegal. freedom of movement for all! act against british and european borders and inhuman border controls. Come to the Calais protest camp 23-29 June. There will also be a transnational demonstration on Saturday 27th of June in Calais. More than 70 people including No Borders activists from Manchester, Leeds and Newcastle took a successful action against the Immigration prison at the Manchester airport. Protest demanding the closure of Pennine house, an asylum prison located at Manchester airport started with a rally in Albert square, Manchester. 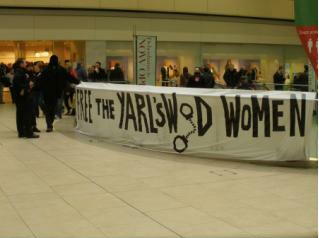 The protest continued to the airport. Half of the No Borders activists cycled to the airport and the others travelled by train. A huge police presence accompanied the Critical mass all the way to the airport. GMP mobilised a helicopter and motorbikes. When the both groups arrived to the Pennine house, the police officers and FIT team constructed a protest pen inside the detention prison car park. The protesters refused to enter the protest pen. After the vibrant protest and speeches taken in front of the detention centre the group decided to move to the airport departure zone. The way back to the train station was dramatic as additional TAU, Police dogs nd horses were called in but not deployed. During this period, Terminal 2 was closed.